Lying flat on my back, arms spread out, staring up at the blazing sun – crucifixion position, numb with cold and rigid with fear – « nailed » to this steep freezing cold, ice-covered mountainside. What a punishment. What have I done to deserve this? My ski buddies implored me to go slow, to zig zag, and above all, « Don’t look down » – but once I hit the slope – a giant whoosh, I lost my footing, fell, lost my skis and poles and went rolling 100 metres down the mountain side, first on my arse, then on my back, wondering if this was my last moment, until, miraculously I came to a halt. And in my slippery wake, I had brought down two friends, who like me slid down the mountain. They lay « intertwined » all bodies and skis a few metres away. All the while, I could hear whoops of laughter from above – as skiers on the chair lift guffawed at our slippery antics and filmed us on their Smartphones. Just how many people are now watching my fall, slide and dented pride on social media sites? 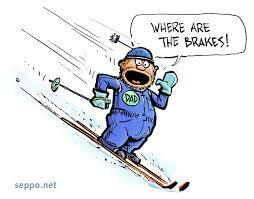 My ski friends implore me to stand up, put my skis on and follow them down the mountain. Calm down and think. Just how I’m going to get off this f***ing mountain. I certainly ain’t skiing down, besides, my skis and poles are still 100 metres up the slope. There are just two solutions: I can either try and slide down on my arse or my back , perhaps using my arms and legs as some kind on brake, or, I can just get up and walk off. Considering the first solution … well my 100 metre arse/back slide was actually pretty fast and I’m not sure that I will be able to control my speed. I’m getting these kind of slapstick cartoon clichés, whereby rolling down the mountain, I’ll turn into a giant snowball, picking up other skiers in my wake before finally crashing into the chalet at the bottom of the ski run. The second solution, therefore seems far more achievable, except I am rigid with fear still pinned/nailed down to this mountainside by what is no more than a self-induced, advanced neurotic state that I will now refer to as Post Traumatic Ski Disorder – PTSkiD – something that I will suffer from for the rest of the holidays, to the point that putting on skis, and standing at the top of a run makes me want to be physically sick. Fred and Ginger are one thing. I won’t be waltzing off this mountain, but now that some kind skier has retrieved my ski poles, then I’ll be walking off. I manage to stand up and now ; it is with Nancy Sinatra in my head that I precariously step and «sideways tip toe » my way down the rest of the slope. I look ridiculous. I don’t give a f***, there is nothing broken and … well a quick word on ski boots – they sure as hell ain’t made for walking. … actually getting your confidence back is one hell of a job. The next day, I get a mild panic attack in the cable car, that disgorges a crowd of keen skiers at the very top of a mountain, all with the one sole purpose, sliding down to the bottom on two lengths of laminated wood. What is the appeal? I used to like this. I used to be a reasonable skier at my own basic level and this morning’s run is hardly the stuff of Olympian downhill difficulty. The keen kamikaze skiers have all swished off down tortuous, semi suicidal black runs, and I am about to take a long lazy meandering green run that slithers like a dead snake on Valium. Nothing to fear, besides, I’ve already done this run, but, I’m sweating and shaking as I clamp on my skis, I want to be physically sick, and as the slow run starts, I just block. « One must confront one’s fear to overcome one’s fear. » This is the line my mum’s therapist used to spin her to get her back behind the wheel after a minor car accident – it never worked. I’m not a fan of this kind of therapy – I find it more Orwellian – Winston Smith in Room 101 – well that is how I feel right now. In the end, my friends get me down the slope – but I still fall ten times in the process, and after this hapless and hopeless run, I feel useless, incapable, surplus to requirements and a burden on my ski friends. Dented pride is one thing, this is far more. I can blame this on the poor quality snow, that isn’t really snow, but the recycled, manufactured stuff, blown across the slopes by snow machines and lying in a sparse covering like frozen icing sugar on a frozen mountain side. I haven’t been skiing, I have been ice skating with skis. I can blame this on me. I hate taking risks, I hate leaving my comfort zone. I like to navigate in calm, shallow and familiar waters. It’s always alarm bells, panic stations and abandon ship when an ice cube sized iceberg « looms » on the horizon. You gotta slip once to know how not to slip again. Posted in deepest france, France, Fun, Holidays, Life, Music, Philosophy, ski, Sport, Tourism, TRAVEL, Weather and tagged accident, arse, Auvergne, confidence, Fred Astaire, Ginger Rogers, Nancy Sinatra, Pick Yourself Up, pride, ski, snow, Superbess, Swing Time. Bookmark the permalink.